Last L-carnitine in liquid Trec. Now it's even better assimilated, more concentrated and harder operating formula. Accelerate the loss of excess fat tissue and enjoy the effects achieved with this product! The highest quality and purity of the active substance! Almost everyone wants to slim and athletic figure - thanks to this product will be able to achieve their dreams in a much shorter time and with fewer sacrifices. Effective but not causing the yo-yo effect l-carnitine only by TREC. TREC L-CARNITINE 3000 is a formulation containing liquid form of L-carnitine. This component is essential for lipid metabolism, which allows efficient transport and burning of fatty acids in cellular energy centers. High levels of L-carnitine is particularly beneficial in athletes and those looking to reduce body weight. The result of this advanced supplement is to improve the quality of muscle tissue - definition. TREC L-Carnitine 3000 has been created in order to help you get rid of excess fat. It comprises a biologically active L-carnitine, which performs an important function in the body of the conveyor fatty acids. Gets fatty acids of the intracellular fluid and transferred to cellular energy centers, where there is a process of combustion. This gives you more energy and can train more intensively. Another important benefit from the use of L-carnitine is to improve the functioning of the cardiovascular system and lower cholesterol. Now you can better take care of your health! 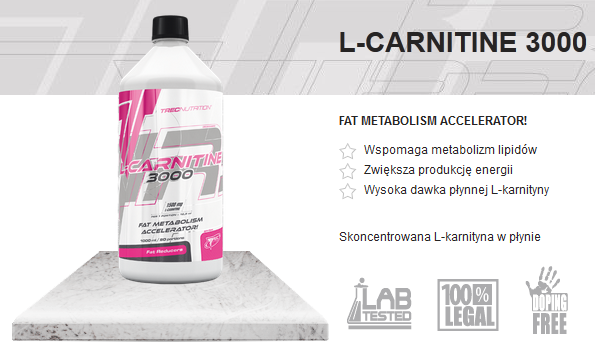 L-Carnitine 3000 YOUR WAY TO Slim and Fit Weight! Składniki: woda oczyszczona; L-karnityna; kwas cytrynowy – regulator kwasowości; aromat morelowy dla smaku morelowego; aromat wiśniowy dla smaku wiśniowego; aromat grejpfrutowy dla smaku grejpfrutowego; sorbinian potasu, benzoesan sordu - substancje konserwujące; cyklaminan sodu, acesulfam K, sukraloza, sacharynian sodu - substancje słodzące; koszenila - barwnik da smaku wiśniowego i grejpfrutowego. Stosuje zawsze rano na czczo i przed treningiem, z efektów jak na tą chwilę jestem bardzo zadowolona, oby tak dalej!